Today's charter train on the Leadville, Colorado & Southern. The view from the Leadville, Colorado & Southern is hard to beat. The restored Como depot on a gorgeous Colorado afternoon. COLORADO SPRINGS, Colo. — Day Two of the Trains Tour of Colorado featured a visit to an old friend of our tour groups, and a new stop with a notable place in the state’s railroading history. Up first today was a visit to the Leadville, Colorado & Southern, a regular feature of our tours and one that I think has been a new experience to a majority of our travelers. I’m delighted we can introduce them to it; the highest standard gauge railroad in North America (the tracks reach 11,318 feet, although that portion of the railroad is not operated regularly) is an operation that deserves to thrive. Ken and Stephanie Olsen bought the railroad for $10 from Burlington Northern in 1987 and began operations the next year, and as the LC&S concludes its 30th year of operation on Sunday, I think it remains a bit of an underappreciated gem. We’ve always found the Olsens — who have made the railroad a true family business — to be gracious hosts, and the scenery is on a par with any tourist railroad in the country. I mean, just look at that photo at right. I had a few minutes to talk with Ken Olsen after our trip; he said his railroad has had a good season but is dismayed that the state’s tourist rail industry had a tough year in many ways, including the closure of the Pikes Peak Cog Railway. 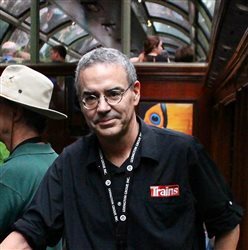 He understands the big picture: the more tourist rail attractions there are, the more people are likely to come visit the state and include his railroad on their itinerary. We’ll keep visiting Leadville on our tours, and I hope others who make their own Colorado rail journeys will do the same. This is an operation that deserves to thrive. In the past, we’ve followed our visits to Leadville with a trip up Pike’s Peak. But with the Cog Railway shut down, today we added a stop in Como, Colo., where efforts to preserve and revive a former division point of the long-defunct Denver, South Park & Pacific are worth a look. Como’s original 1879 station — on the verge of collapse from neglect a decade ago — has been beautifully restored. It is now connected by a short stretch of track to a six-stall stone roundhouse, built in 1881, that has also been revived after decades of disuse, with a new roof and doors capping the original stone walls. The restoration effort has also brought in a Baldwin 2-6-2, built in 1912 for a mining operation in the Yukon Territory, that operated in Como for the first time in 2017. The locomotive is currently sidelined awaiting repairs. One notable aspect of the Como revival is that it is a collaborative effort of two separate historical groups — the Denver, South Park & Pacific Historical Society and the South Park Rail Society — with broad public support. Significant credit also goes to Chuck and Kathy Brantigan, current owners of the roundhouse; Bill and Greg Kazel, the prior owners; and David Tompkins, owner of the station. There was a time, not all that long ago, when the town had little more to show for its railroading history than a station near collapse and a roundhouse with a roof that had caved in. It would have been difficult, if not impossible, to imagine Como as a destination for anyone other than the most hard-core fans of Colorado narrow gauge history. But — thanks to the vision of volunteers who imagined just such a day — the restoration effort is changing that, and as that work continues, visits to Como will should become even more attractive in the years ahead.